You may not have heard of journalist Daphne Caruana Galizia who was murdered six months ago, but Meryl Streep certainly has and it would not surprise me if the Oscar winner optioned DCG's story. There is a particular sub-category of posthumous fame reserved for those who become larger in death than in life. A Che Guavara or James Dean – or even a Steve Biko locally – have become more significant with – or because of – their demise than the importance they were accorded when alive. In the last six months, Malta has produced just such an iconic presence. Although 30 years in PR has sensitised me to media worker’s bylines, it takes an exceptional journalist – or an exceptionally controversial journalist – to jump the rails from reporting to being reported about. Even rarer, to become an international news item. From being a divisive Maltese media personality in life, investigative journalist Daphne Caruana Galizia has become a totemic figure with her death in October last year. Killed in a car bomb blast as she was driving from her home, DCG’s assassination (as it is termed here) has meant that instead of reporting the story, she became the story. Bonini may even have underestimated her significance as the American Society of Journalists and Authors has just announced that it will be honouring her with its prestigious Conscience in Media Award at its ceremony in May. Founded in 1948, ASJA is the US's professional organisation of independent non-fiction writers. The Conscience in Media Award recognises journalists who knowingly have endured great personal costs while pursuing the highest tenets of their profession, ASJA president Sherry Beck Paprocki said. This selective award has been presented only 12 times since 1975. Streep is very much aware of DCG having mentioned the Maltese journalist when addressing the CPJ International Press Freedom Awards in January this year and on Christine Amanpour’s eponymous TV programme during the actress’s promotional duties for The Post. Meryl and Daphne look curiously alike and share a similar bone structure – put a long dark wig on Streep and you have a doppelganger for Galizia. To this day, an ongoing item in our local papers is the informal memorial dedicated to DCG. 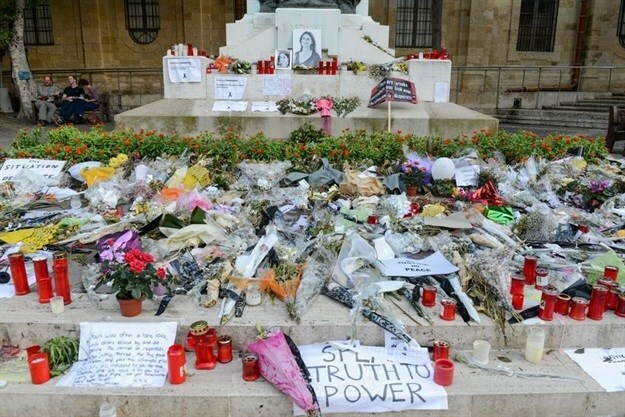 Placards, flowers and candles are regularly placed on the Great Siege monument in Valletta in front of the tour group entrance to St John Co-Cathedral and opposite the capital’s Law Courts. Just as regularly although generally mysteriously and under cover of darkness, the tributes are swept away only to be replaced the following day. The fact that this clearing – considered a form of censorship – continues to attract media attention in defiance of the intention of the removals task force, must be a source of satisfaction to Daphne on whatever celestial cloud she has plugged her heavenly laptop into. Footnote: More than 700 journalists have been killed over the past decade, according to Reporters without Borders (RSF).